Big East challengers like Butler, Georgetown, Seton Hall and Xavier will look to prevent Villanova from running away with the conference in 2016–17. With summer recruiting heating up and summer sessions underway, SI.com is taking a look at the state of each conference. Players are listed by what year they will be in the 2016–17 season. Click here for the American, ACC and A-10. Below, the Big East. Villanova isn’t just in a prime position to repeat as Big East regular season champions—it also has a real opportunity to win back-to-back national titles. That can be a rare thing to say in the one-and-done era, but the Wildcats were built on experience rather than freshmen stars and bring back their top two scorers, seniors Josh Hart (15.5 ppg) and title-game hero Kris Jenkins (13.6 ppg), as well as sophomores Jalen Brunson and Mikal Bridges and junior Phil Booth. The losses of guard Ryan Arcidiacono and center Daniel Ochefu to graduation will absolutely be felt, but incoming five-star center Omari Spellman should give ‘Nova a strong inside option in Ochefu’s absence. With all the attention on Villanova winning the national championship, it may be easy to forget that the Wildcats actually fell short in the Big East tournament. That title belonged to a young Seton Hall team that surged into the NCAA tournament having won eight of its final nine games. Big East tournament MVP Isaiah Whitehead has moved on to the NBA (the Utah Jazz selected him with the 42nd pick and traded him to the Brooklyn Nets) and Derrick Gordon’s one year as a grad transfer is over, but the Pirates still bring back a solid core that includes junior guard Khadeen Carrington and junior forwards Desi Rodriguez and Angel Delgado. The Kevin Willard-led group largely flew under the radar last season, and the success the Pirates tasted in 2015–16 should serve them well going forward. The Bluejays have taken a step back since the 2014 graduation of Doug McDermott, but they did reach the NIT quarterfinals last season. Waiting in the wings was Foster, who transferred from Kansas State in 2015 and is set to be eligible this season. The guard was an All-Big 12 second-team pick after averaging 15.5 points as a freshman, though he saw his numbers dip across the board during a sophomore season that included a three-game suspension. Now with a fresh start at Creighton, Foster joins a team that returns three of its top four scorers and looks poised to make noise in the league. He will pair with Maurice Watson Jr. in a backcourt that could wind up the best in the conference. Few would have expected a year ago that Bentil would join Kris Dunn as Friars to leave early for the 2016 NBA draft, but that’s because few foresaw how Bentil would emerge last season, leading the Big East in scoring with 21.1 points per game. The duo represented half of Providence’s scoring, while Bentil also led the team in rebounding and free throw shooting. Dunn’s draft declaration was essentially a foregone conclusion, but Bentil, who was picked 51st by Boston, was less of a sure thing. Bentil’s return would have kept the Friars out of full rebuilding mode, but instead Providence, which has made three straight NCAA tournaments, will likely take a significant step back next year even with the talented but inconsistent sophomore forward Rodney Bullock back. Butler: An obvious area of improvement for the Bulldogs next season is on defense. They went from one of the top defensively efficient teams in the country in 2014–15 to a middle-of-the-road one in the Big East last season. Butler also needs to find a way to replace the leadership and scoring of Kellen Dunham and Roosevelt Jones, a void Memphis grad transfer Avery Woodson should help fill. Creighton: Reasons for optimism for the Bluejays are above, but keep in mind they also lost seven of their last 11 games before the NIT. Creighton needs to find more consistency and must fare better against the Big East’s top teams (it went 2–7 against the top four) if it wants to make the jump to a true contender. DePaul: Not much went right for the Blue Demons last season, and leading scorer and rebounder Myke Henry is gone. Guard Eli Cain had a promising freshman season (10.3 ppg, 42.5% from three) that DePaul should build around, and the squad should get a perimeter-scoring boost from WKU grad transfer Chris Harrison-Docks. Georgetown: The Hoyas completely fell apart down the stretch last season, and their young core of L.J. Peak, Isaac Copeland and Marcus Derrickson needs to put that in the rearview mirror. Better three-point shooting, offensive rebounding and a tighter handle on the ball are good places to start, as well as taking advantage of what should be great depth. • Recruiting Notebook: How is Amaker luring top prospects to Harvard? Marquette: The Golden Eagles were one of the youngest teams in Division I last season, which means that even with Henry Ellenson off to the NBA, they have something to build on (and add USC grad transfer Katin Reinhardt). But Marquette has to find a way to replace Ellenson’s rebounding—a bright spot in an otherwise weak area for the team—and it’s not immediately clear where that will come from beyond senior center Luke Fischer. Providence: Where do you go next after you lose a duo as important as Dunn and Bentil? Even with those two, shooting was a glaring weakness for the Friars, and improving on it is the most obvious way to compete again this winter. All eyes will be on Bullock, a breakout candidate no longer in anyone’s shadow. Seton Hall: Free throw shooting was a sore spot for the Pirates last season, as their 65.8% team mark left too many free points on the floor. With Whitehead gone, finding another reliable three-point shooter besides Desi Rodriguez will be important too—incoming sharp-shooting freshman Myles Powell is the most obvious candidate. St. John’s: The good news for the Red Storm is that it’s hard to go anywhere but up after Chris Mullin’s first year ended on a 1–21 slide. St. John’s needs to get considerably stronger on offense if it wants be more than a conference doormat next season after shooting 40.6% from the floor and 32.6% from three as a team. Villanova: How do you improve on a year that resulted in a national championship with a Hollywood ending? The Wildcats didn’t have many flaws last year, but one area of weakness was their offensive rebounding—and they lose Daniel Ochefu, who posted the team’s highest offensive rebounding rate (11.3%). Avoiding complacency as the defending champs will also be key. 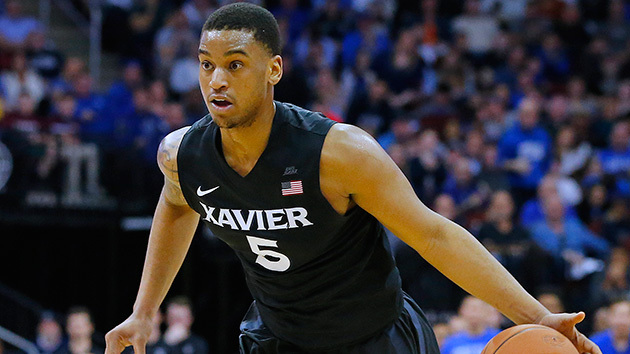 Xavier: When guard Trevon Bluiett announced in May he was returning to school for his junior season, it solidified the Musketeers as the biggest challenger to Villanova. Xavier brings back its top three scorers but will need to step up on the glass after losing its best two rebounders, lest a strength turn into a weakness.